With the launch of Windows 10 back in July Microsoft presented a unified front to the world, making a persistent ecosystem running through its PCs, tablets, phones and its Xbox One console. Now it's finally released the new Xbox One dashboard that's a reality which is getting ever closer. To make it a reality though the big M had some work on the two-year-old Xbox One Dashboard. Thankfully the Windows 10 kernel is already sat inside your hulking great gaming console, and come this November update it's gotten a much-needed tune up. Not only are you getting a host of new features to tie into the new Windows operating system, like cross-platform play and game-streaming, but you should notice some serious improvements to the consoles interface. The new update is all about speeding things up. One of the biggest complaints of the previous Xbox One UI was that it was just so damned sluggish. Just shifting between panels took an age and loading up an app would likewise take a frustrating amount of time. 6 best Windows 10 laptops, tablets and 2-in-1s: which one is right for you? The plan's been to improve loading times across the whole interface. With it's system memory superiority over the PS4 it's a surprise that things aren't a whole lot more zippy in the current dashboard. Gone is the utter reliance on horizontal scrolling. Now, to get deeper into a topic, you can scroll vertically. You still shift between categories by moving left and right through the different pages and screens, but now as you scroll down you'll be presented with more options related to that particular section. This is most obvious on the new Home screen. Your most used apps and games now appear at the top of the screen and then if you scroll to the bottom of the Home screen you'll see you 'pinned' programs. You can select which apps and games you want to always be stuck there. The new Home screen boots straight into the recently-played section, highlighting the most recent games and apps. In that you get more info about the game too, such as your DVR clips or whether there's a new update waiting to be installed. 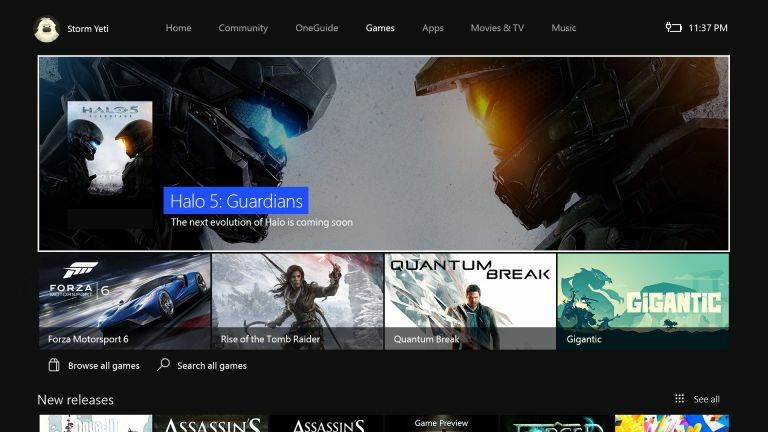 The new Xbox One dashboard is also set to be a lot more social too, and socially aware. There is a new community hub that will bring up what your friends are up to in the Activity Feed, whether they're in-game at the moment or whether they've achieved something monumental too. This is also where you'll be able to interact with their posts too, if you really dig that pseudo Facebook vibe. Linked into that more social side of the new update is the return of the Xbox Avatars to a more prominent position within the dashboard. They used to be plastered all over the old 360 interface, but Microsoft seemed to be going for a more 'grown up' look to its console; part of its push to make it a device for everyone, for every living room. Double-tapping the 'burger' button on your Xbox One pad will bring up the new guide, when you're in-game or you can scroll to the left on the dashboard. The new guide area is where you can get instant access to your friends lists, party invites or messages. You'll also find all your notifications in there too. The impressive thing is just how quickly the demos have shown the guide popping up in-game. There's no scaling of the screen and it looks like zero lag when switching between the guide and the game. Starting out on Windows Phone the Cortana digital assistant has since made the move to the desktop with Windows 10 and will some make the shift over to the console in the big new update. Cortana's all about voice activated goodness, in a more slick way than Xbox has been able to do things simply via its Kinect hardware. Its more natural understanding is designed to make it easy for you to hook up with friends online, inviting people to your game without even having to hit pause. It will also let you dictate messages and record your 1337 gaming skillz to spam your friends' activity feeds with. As well as all the new improvements that have been made the big new feature is that of backwards compatibility with existing Xbox 360 games. Sadly Red Dead Redemption is still missing, even after the campaign which started immediately after Microsoft started taking votes on what games should be next. But Microsoft isn't stopping there and will be announcing new backwards compatible games in December, like Bioshock 1 & 2. It works by emulating the original Xbox 360's software. So long as you have the disc and it's a compatible title, then all you do is slot it into your Xbox One's drive and it should play as normal. You can download older titles if you want to. This is going to give the Xbox One quite the back catalogue. With Windows 10 and the Autumn Update, can the Xbox One still be called a games console?